This coming Wednesday, July 11th, we’ll be joining the entire Benedictine Family in celebrating the Solemnity of Our Father, St. Benedict. There will be no change in our regular liturgical schedule since the day is not a Holy Day of Obligation. 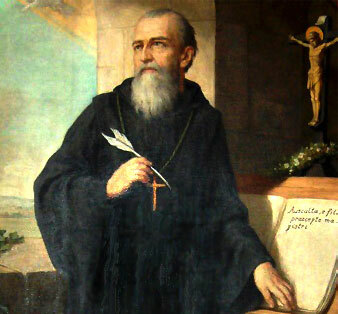 St. Benedict authored his Rule in the 6th century and is the one we here at Genesee follow today according to the Cistercian/Trappist reform along with the thousands of monks and nuns in the Benedictine tradition world wide. This month marks the 2nd anniversary for our Specialty Bakery which continues developing and doing quite well. 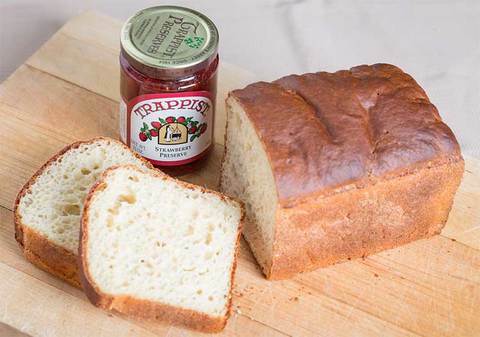 To mark the occasion we are pleased to offer our newest creation, English Muffin Bread! It has all the taste and texture of an English muffin, in the body of a farm style loaf. Packaged unsliced, you can cut your slices as big as you’d like! We’ve been perfecting the recipe for the past few months and selling the loaves at our Gatehouse Store at the Abbey of the Genesee. Our neighbors and visitors are giving it great reviews. It is now available on line at $4.99 per loaf with an introductory offer of 15% off. To order go to Monks’ Specialty Bakery and use promo code: 15MONKS. Whoever you are, therefore, who are hastening to the heavenly homeland, fulfill with the help of Christ this minimum Rule which we have written for beginners; and then at length under God’s protection you will attain to the loftier heights of doctrine and virtue which we have mentioned above.